Some girls daydream about being on the beach. Some girls daydream about their weddings. and I daydream about food. Not even eating it, just making it. Lately these daydreams have been filled with lemon and citrus, avocados, always chocolate, vegan caramel, and strawberries. I decided to make the last fantasy a reality. A delicious, delicious reality. That's right, these are double-delicious. 1. Preheat your oven to 375º and line a muffin tin. 2. In a large bowl, whisk together the soy milk, yogurt, oil, agave and vanilla. Stir in the flour and baking powder until just combined. Fold in the strawberries. 3. Divide the batter evenly into 12 muffins. Bake for about 20 minutes or until a toothpick comes out clean. Let cool for about 10 minutes and enjoy! Side note: If you haven't seen yet, I have updated my list of favorite blogs to the ones I've been following more recently. There are some beauties on there, check it out! What do you tend to daydream about? Thank you so much, thecookiefairy! I also daydream about making food but I have to say that I often daydream about raising kids and having a nice little house. A nice wedding is also very fun to daydream about! Those are also pleasant daydreams :) I like to daydream about my future house with a huuge vegetable garden. And thank you! I think I could pop three of these into my mouth right now! Gorgeous photography! I want to write a song about these muffins. 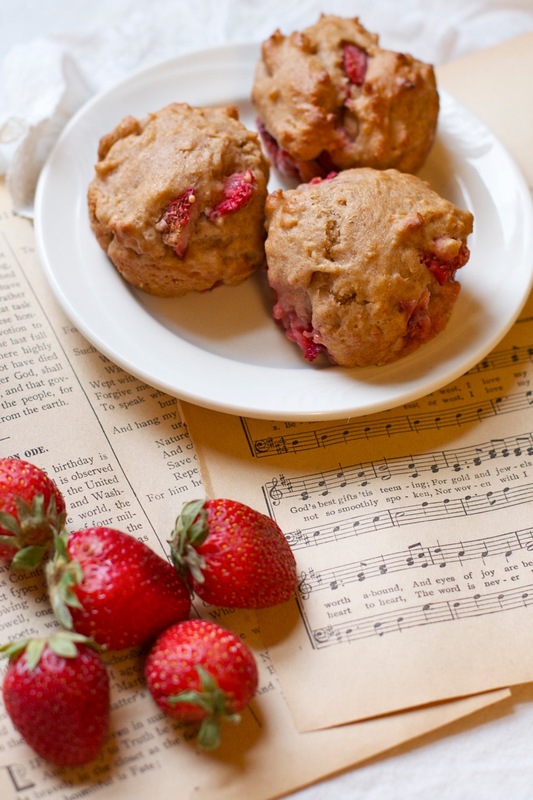 And now, I think I will dream about these strawberry muffins! Haha I would love to hear a song about these muffins. 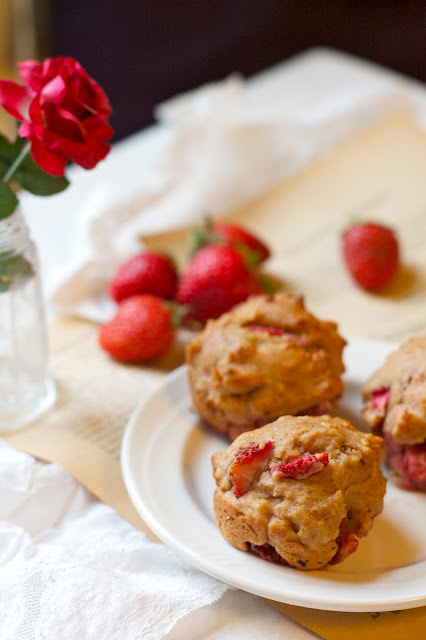 What a beautiful, simple and healthy muffin recipe. Stunning photos -- makes me think of Paris or some where equally as romantic. I can't wait for strawberries to show up in my market. Thank you! 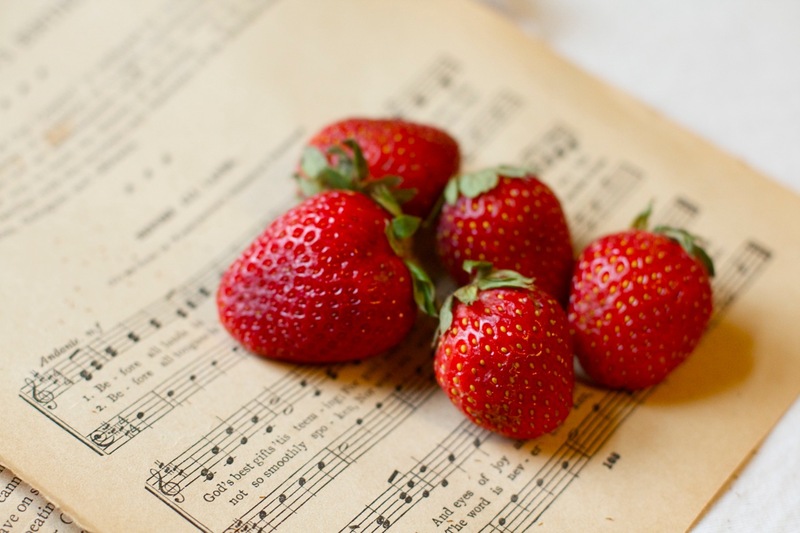 Strawberries are my favorite fruit, and, in my opinion, the most romantic food. I mostly daydream about food. But I also daydream about thrifting great dishes & dresses, petting cats, & long summer nights with my friends. Ohh I daydream about all of those things too! Especially thrifting. 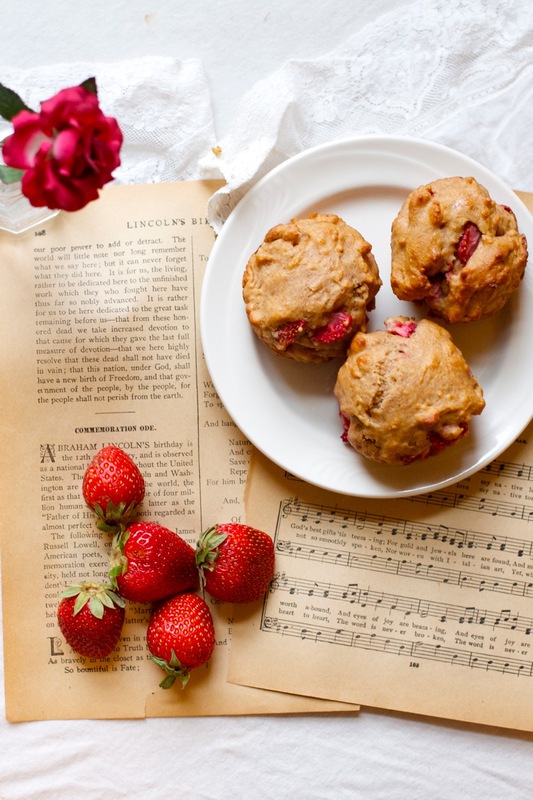 I love double delicous muffins and I love how you styled them! Thanks! Those are my top two as well! 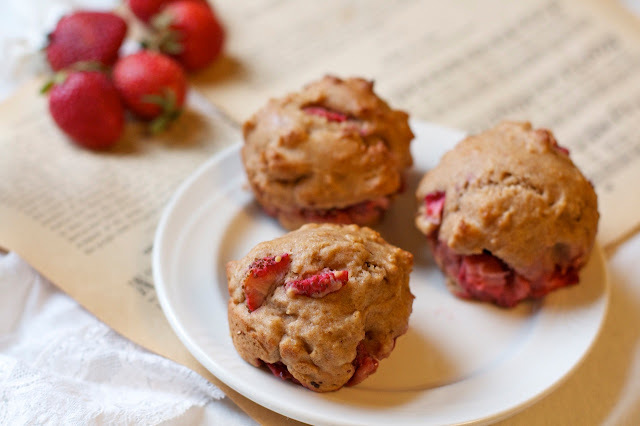 They should be slightly moist because of the strawberries, but they should not be wet! Are you sure they were cooked for long enough? Some people have varying oven times. I'm not very good at conversions, but it is possible something went a little off there, also. Sorry they didn't quite work out! i've figured out what my muffins taste like/what the texture is like ..
Hmm that's interesting... well I really hope they work out for you this time! You're welcome! These look scrumptious! Fabulous photography, too. Thanks for your lovely blog, Ruby. Sending vegan love from Ontario. Thanks, Sarina! I'm so glad you stopped by! I daydream about making food too!!! You're not alone! It's just so much fun, isn't it?? 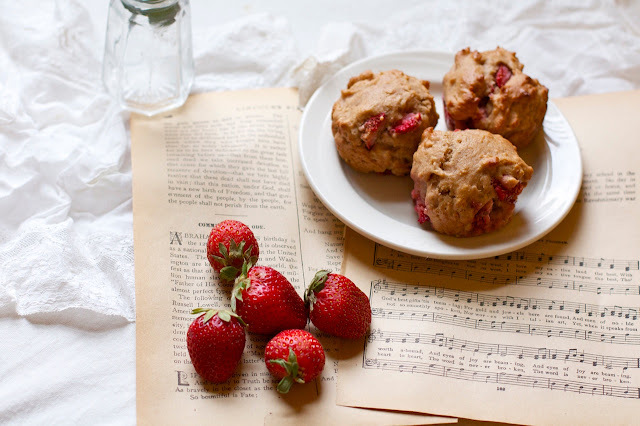 It looked like such a lovely recipe, but I just tried baking them and they turned out super uncooked in the middle/on the bottom, I've got an oven thermometer so i don't think thats the problem, but it seems very strange...Beautiful photography and a lovely post however! Hi Caitlin! I'm sorry they didn't work out for you. I didn't have a problem with that with these muffins- the only thing I can think that would be the case is that you did not cook them for long enough. I've noticed that my oven tends to cook things a little faster than other ovens, so the toothpick trick is imperative here! Also the tops of the muffins did begin to turn golden brown before they were fully cooked, so that can be a little tricky. I hope that helps!